Every year, the Society of Petroleum Engineers (SPE) recognizes members who have made an exceptional effort to ensure the technical excellence of the Society’s peer-reviewed journals. Nikos Varotsis, Professor at the School of Mineral Resources Engineering of TUC, has been selected by the SPE Journal Associate Editors to receive the 2017 Outstanding Technical Editor Award, for his contribution and for the dedication to technical excellence provided to authors, to SPE, and to the industry. The award recipient list will be published in an upcoming issue of the SPE peer-reviewed journals and the December issue of Journal of Petroleum Technology (JPT). Professor Varotsis, together with other honorees will receive his award at the Publications Reception to be held in San Antonio on October 8, 2017 during SPE’s Annual Technical Conference & Exhibition. 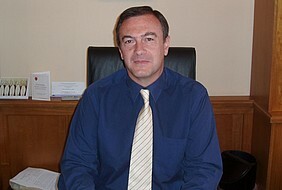 Professor Nikos Varotsis holds a Chemical Engineering degree from NTUA, MEng and PhD degrees in Petroleum Engineering from Heriot-Watt University, Scotland and he is Director of the PVT & Core Analysis Laboratory of TUC. Before joining academia, he served as Research and Development Head for PVT and Fluid Analysis for Schlumberger in Paris, France for 6 years during which time he was invited to give several talks in different countries around the world. He is acting Consultant on Phase Behavior and Fluid Analysis for the international oil industry since 1990 and he has co-ordinated and participated in dozens of Research Projects funded by the European Union and international oil companies. He holds 2 US and 2 European patents and he has authored over than 100 scientific papers and technical reports for international journals and conferences and for the oil industry. Professor Varotsis has served as Vice Rector for Finance Planning and Development and Chairman of the Research Committee of the Technical University of Crete (2005-2010) as well as Mineral Resources Engineering Chairman (1999-2003).